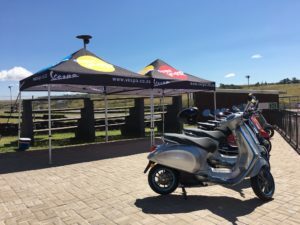 What an exciting event Saturday was at Zwartkops Raceway South Africa; the launch of the brand new Vespa high-tech electric Scooter; the 2019 Elettrica. A very friendly Team, helpful and highly professional to deal with – AMS are proud suppliers to Vespa. We thank you for such a valued partnership. Outdoor Brand Enhancers are practical and highly effective products. They`re easy to assemble, disassemble and pack away. Your brand will be highly visible from many angles. 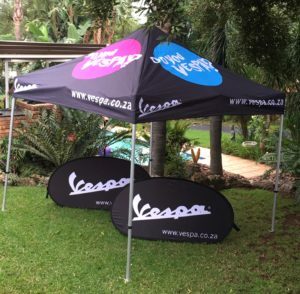 Besides being brilliant brand visibility Gazebos provide shade for people, cars and bikes. We`ve been in business for 19 years! Our experience, service and advice = building your brand equity.